"Basketball Arena" redirects here. For the arena in London, see Basketball Arena (London). Basketball courts come in different sizes. In the National Basketball Association (NBA), the court is 94 by 50 feet (28.7 by 15.2 m). Under International Basketball Federation (FIBA) rules, the court is slightly smaller, measuring exactly 28 by 15 meters (91.9 by 49.2 ft). In amateur basketball, court sizes vary widely. The baskets are always 10 feet (3.05 m) above the floor (except possibly in youth competition). Basketball courts have a three-point arc at both baskets. A basket made from behind this arc is worth three points; a basket made from within this line, or with a player's foot touching the line, is worth 2 points. The free-throw line, where one stands while taking a foul shot, is located within the three-point arc at 15 feet from the basket. A foul shot is worth 1 point, but if a shot is made from the foul line while in play it is still worth 2 points. * The NBA three-point line is 3 ft (0.91 m) from the sideline in a zone starting at the baseline and ending when it crosses the 23.75 ft (7.24 m) arc. The 22 ft (6.70 m) distance exists only at the points on the three-point line that are directly to the left and right of the basket center. † The FIBA three-point line is 2.95 ft (0.90 m) from the sideline in a zone starting at the baseline and ending when it crosses the 22.1 ft (6.75 m) arc. The 21.65 ft (6.60 m) distance exists only at the points on the three-point line that are directly to the left and right of the basket center. The three-point line is the line that separates the two-point area from the three-point area; any shot converted beyond this line counts as three points. If the shooting player steps on the line, it is counted as two points. Any foul made in the act of shooting beyond the three-point line would give the player three free throws if the shot does not go in, and one if it does. The NBA adopted the three-point line at the start of the 1979–80 season. This is of variable distance, ranging from 22 feet (6.7 m) in the corners to 23.75 feet (7.24 m) behind the top of the key. During the 1994–95, 1995–96 and 1996–97 seasons, the NBA attempted to address decreased scoring by shortening the overall distance of the line to a uniform 22 feet (6.7 m) around the basket. It was moved back to its original distance after the 1996–97 season. FIBA and the NCAA both adopted the three-point line in 1985. The perimeter is defined as the areas outside the free throw lane and inside the three-point line. Shots converted (successfully made) from this area are called "perimeter shots" or "medium-range shots." If a player's foot is on the three-point line, the shot is considered a perimeter shot. The low post is defined as the areas that are closest to the basket but outside of the free throw lane. This area is fundamental to strategy in basketball. Skilled low post players can score many points per game without ever taking a jump shot. The key, free throw lane or shaded lane refers to the usually painted area beneath the basket; for the NBA it is 16 feet (4.9 m) wide, for the NCAA it is 12 feet (3.7 m) wide; for both instances it extends 15 feet (4.6 m) from the backboard. At the top of the rectangle is the free throw line, behind which players shoot uncontested shots when they're fouled. A circle is drawn around the free-throw line with a 6 feet (1.8 m) radius; this is used for jump ball instances, as is done at the center circle. Two 6-inch hash lines, 3 ft from the free throw lane line and 5 ft 8 in from the free throw line, show the lower defensive box linked to the restricted area. For FIBA tournaments, since October 2010 the key has been a rectangle 4.9 m wide and 5.8 m long. Previously it was a trapezoid 3.7 meters (12 ft) wide at the free-throw line and 6 meters (19 feet and 6.25 inches) at the end line. The key is primarily used to prevent players from staying beneath the basket of the opponents' team for long periods (maximum three seconds). The no charge zone arc is a semi-circular arc drawn around the area directly underneath the basket. With some exceptions, members of the defending team cannot draw charging fouls in this area. The no charge zone arc in all North American rule sets above high school level (NCAA men's and women's, NBA, and WNBA) has a radius 4 feet (1.22 m) from below the center of the basket. The no charge zone arc rule first appeared at any level of basketball in the NBA in the 1997-98 season. The NCAA restricted area arc was originally established for the 2011–12 men's and women's seasons at a 3-foot (0.91 m) radius from below the center of the basket, and was extended to match the 4-foot radius for the 2015–16 season and beyond. On NBA floors, two hash marks are drawn at the end lines near the key to mark the area known as the lower defensive box. A defensive player is allowed to draw a charging foul within the restricted arc if the offensive player receives the ball and/or starts his drive within this area. Also, two lines are drawn on each of the sidelines, 28 feet from each of the endlines, which designates the extent of the coaching box and bench. This line marks the farthest extent a coach (aside from the sidelines) can stand. Directly behind this area is the team bench. On the half-court line of NBA floors two lines extend outside the playing court, designating the place where substitutes wait before they can enter the playing court; directly behind this area are the various off-court officials such as the timekeeper and reserve referee. On April 26, 2008, FIBA announced several major rules changes involving the court markings. These changes took effect for major international competitions on October 1, 2010, after that year's World Championships for men and women, and became mandatory for other competitions on October 1, 2012 (although national federations could adopt the new markings before 2012). The changes were as follows. The shape of the key changed from a trapezoid to a rectangle as it is in the NBA, with NBA dimensions. The three-point line moved back to 6.75 meters (22 ft 1.7 in) from 6.25 meters (20 ft 6.1 in), compared to 23 ft 9 in (7.24 m) for the NBA at the top of the arc. The FIBA adopted the NBA's restricted area arc with a marginally wider radius of 1.25 meters (4 ft 1.2 in). ^ "Official Basketball Rules 2006" (pdf). International Basketball Federation. 2006. Archived from the original on 6 April 2007. Retrieved 2007-04-14. ^ Wissel, Hal (1994). Basketball: steps to success. United States: Human Kinetics Publishers, Inc. pp. ix. ISBN 0-7360-5500-2. 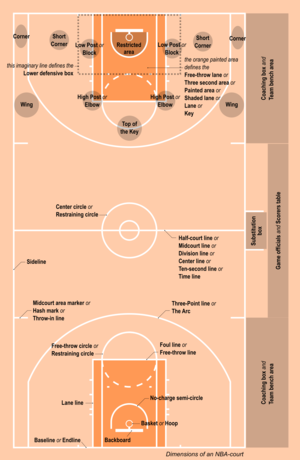 ^ "NCAA Basketball Court Diagram" (pdf). NCAA. 2018. Retrieved March 11, 2018. ^ "Shaq and the No Charge Zone Rule". Factuation. Factuation. July 1, 2015. Retrieved February 27, 2018. 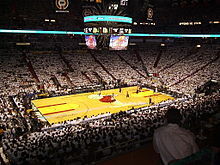 In the 1997-1998 season, NBA added the “no charge zone” or the “restricted area”. This is the portion of the key, denoted by an arc in the painted area that is positioned four feet from the basket. The arc is important because a defending player can not force a charging foul within this area. It was designed to provide benefit offensive post-up player like [Shaquille] O’Neal, players who drive to the basket and limit collisions. ^ "The FIBA Central Board approves historic rule changes" (Press release). FIBA. 2008-04-26. Archived from the original on 30 April 2008. Retrieved 2008-04-28. Wikimedia Commons has media related to Basketball courts. FIBA Central Board (2010-04-17). "Official Basketball Rules 2010: Basketball Equipment" (pdf). International Basketball Federation. Retrieved 2010-07-15.